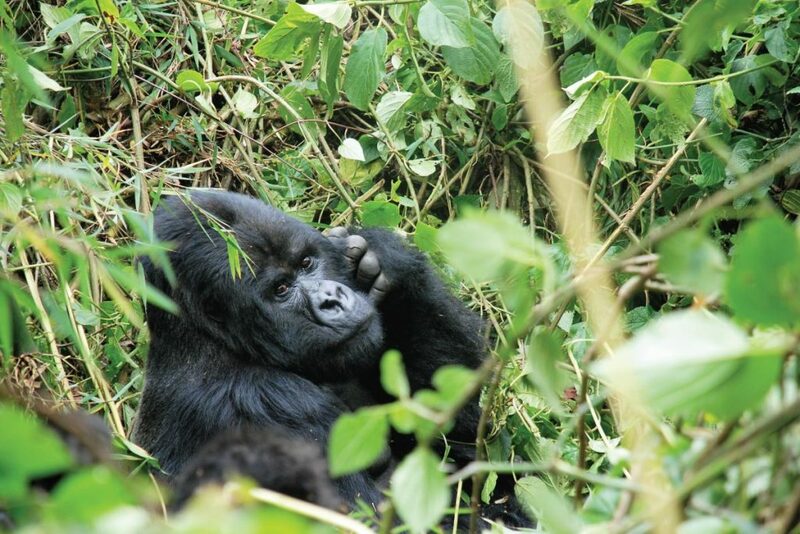 Take a local flight to Bwindi National Park for your Gorilla tour on a journey of about 2 hours with a choice to fly in the morning or afternoon. The journey to Bwindi is an interesting one with great views of spectacular scenery displays all the way. Meet the mountain gorillas of Bwindi in a thrilling encounter that’s perhaps one of the most exciting wildlife experiences on planet earth. Meet and greet at the airport by our driver guide – arriving on a morning flight or pick up from your overnight hotel in Entebbe to catch a scheduled in country flight to Bwindi for your gorilla tour of a life time. Depending your flight option, today its possible to go for an afternoon village walk to explore Bwindi’s local communities, if your stay is within Buhoma area. (the morning flights usually leave at about 07:45 hours arriving at 09:30 hours and the afternoon flights depart at 12:45 hours arriving Bwindi at 14:55 hours) Alternatively arrive Bwindi to refresh, relax and enjoy the available lodge facilities, as you eagerly await your memorable meeting with the mountain gorillas the next day. Today is dedicated to Gorilla tracking which begins at 8:00 am with a briefing from the Uganda Wildlife Authority rangers. Please remember to carry a rain jacket, drinking water, snacks, jungle boots or comfortable covered walking shoes, insect repellent a sun hat and gloves if you like. The guides will lead you inside the jungle to see the shy Primates in the group you have been booked to track. Do not forget to take your lunch boxes and all the necessary gear for a great tracking experience. The tracking lasts between 2 and 8 hours but is well worth the effort. If time allows, on return from the jungle you will go for a village Walk/ Community visit for a great opportunity to see how the local people live. A chance to meet the gorilla’s human neighbors is a delightful moment and a great add on to your gorilla tour. The return flight options from your gorilla tour are: the morning flight departing 09:45am arriving 11:25am convenient for those who fly out of Entebbe in the afternoon and evening. And for those with flights connecting out of Entebbe late, you can opt for a birding experience, and more relaxing soft activities before flying from Kihihi Airstrip at 14:05pm arriving 15:05pm. This gorilla tour will remain a highlight in your life for a long time. The expenses of personal nature like: international Air fare, Visa, soda/alcoholic drinks, laundry, tips to local guides, telephone, and porter fee while trekking, personal insurance, personal shopping bills.